It took me a long time to write this review. 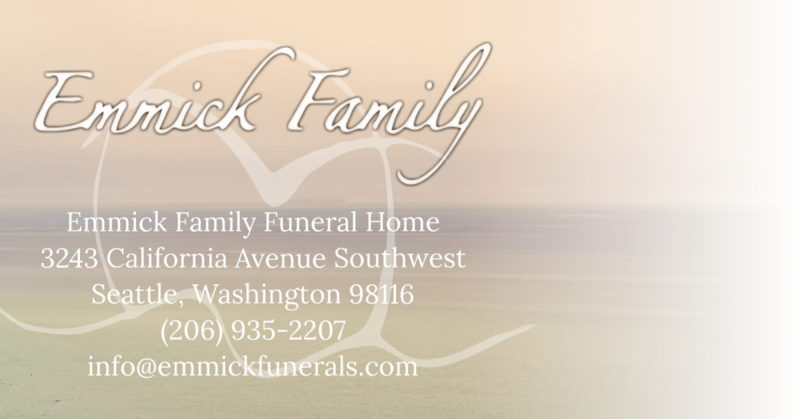 It feels strange to be reviewing something as intimate as the business that helps you navigate the death of a family member, but the Emmick family showed me and my father such kindness after my mothers death that I felt compelled to write this. They took a very difficult situation, and made a concerted effort to not make it any harder than it had to be. The one thing that really stuck with me, was that my mother had requested burial at sea, and so her urn was biodegradable. The day it was time for us to pick her up it was pouring rain. Worried about us having to park far away and risk damaging the urn and her ashes on the walk from the office to our car, they personally delivered her ashes to our home. This was so thoughtful, and so kind, it sticks with me even now, a year later. Thank you. My family and I are so extremely grateful to have been served and cared for by the Emmick family. Desiree and Michael Emmick were constantly showing their compassion and detailed professionalism when working with my great grandmother, my maternal matriarch. Because we had a service here in Seattle and will be transporting her to California where she will be laid to rest after another service, cost is a worry that my family is having. The prices that the Emmick Family offers are so reasonable and gracious. As someone who is experiencing the death of a very close loved one for the first time, the Emmick Family guided and supported me so well in this process. The anxiety that comes with the many moving pieces and details while experiencing such an emotional time was something they were well aware of and seemed to know exactly how to help settle that anxiety through their services. They are also available 24 hours and 7 days a week to answer questions and address concerns. Our service was held at our family's Buddhist temple and the Emmicks were present the entire time and were so respectful and engaging during that time. Along with everything else, this made us feel like they were not just some people we were contracting to do this work for our great grandmother, but people who have such strong dedication to this work of helping people lay their loved ones to rest as respectfully and compassionately as possible. I can't say enough about how impeccable and admirable this family business has been. I would recommend them to anyone. Words really can't express the wonderful service I received from Michael and Desiree Emmick. They made everything personal, compassionate, and very comfortable. They came to my house twice so I did not have to go to the office; Desiree did a magnificent collage of pictures of my husband and I gave her complete freedom to set it up the way she felt best. And it was THE BEST!!! The comments I heard at the celebration of life were all very positive and outstanding. Although this is the toughest and saddest part of life, dealing with the death of a spouse, the great care Emmicks' took of everything made it so much more bearable. My husband, Dr Larry Holder, passed away this last week to brain cancer - glioblastoma. In the midst of all this chaos, Mike Emmick was a shining star. He and his father, Craig, made Larry's passing so much easier with their kindness and professionalism. I dreaded coming to a funeral home. Makes it real, you know? Mike told me to call him when Larry passed, day or night. And when Larry passed shortly after midnight on July 12th, I called. The Emmicks came at 1am, so that there wouldn't be a spectacle in the neighborhood in full daylight. Larry would have hated that. I truly can't thank them enough for all they have done for me, and will recommend them to any and all. They are fantastic. When my mother passed away in 2014 my sister contacted Craig Emmick to take care of her and to assist us in this most difficult time of our lives. Craig and his son Michael were very helpful, understanding and really cared about making sure everything was as our mom would have wanted it.. They walked us through all that needed to be done and took care of all the necessary paperwork. They even attended mom's service which was very thoughtful of them. Our family can't thank them enough for all that they did for us. Last year in 2015 my livelong best friend Jerry passed away. He wanted me to take of his final arrangements. I again turned to Craig and Mike and they did another great job of taken care of everything that needed to be done. They also attended Jerry's military service which they had arrange for me. I really appreciate the respect Crag and Mike gave me and his family. Thanks to both of you for making the grieving process a lot easier. When my father passed away the first person we called was Craig Emmick. Craig and his son Mike are the most helpful, knowledgeable and caring people that you will ever meet. My father purchased a plan from another state. We were too upset to find any paperwork or anything. Mike took care of everything, including us. He found where my dad's plan was, contacted them and took care of all of the details. The Emmicks patiently walked us through every step and did almost everything for us. I am so happy to have the Emmick Family to turn to when disaster strikes. West Seattle is such a tight knit community, it is great to have caring. honest West Seattle people to turn to. Thanks, Mike and Craig you make death easier for those of us grieving.